Jesus has done two major healings and has claimed to be the King of Rest, the Lord of the Sabbath. And His enemies, the Pharisees, have been angry that He did these two healings and have counter-claimed that Jesus is, in fact, the King of the Demons or at least in league with Beelzebub, the prince of demons. You can see that there is no middle ground between these two positions. Jesus has all but said that He is the Son of God because He has claimed that He is Lord over the Fourth Commandment from God! But the Pharisees have said that Jesus is actually Lord of the Flies. Lord of the heap or at least working for him. There is no middle ground, no compromise, between these two extreme positions. And Jesus has used this moment of tension to invite people to trust and follow Him. Jesus has invited us to come to Him in our weariness and under our burdens, and He will give us rest. He has invited us to take His yoke of discipleship on ourselves and walk with Him, learning from Him, and He will give us rest for our souls. Because His yoke is easy, and His burden is light. He is gentle and humble in heart. A bruised reed He will not break, and a smouldering wick He will not snuff out. Jesus is not in league with Satan. His kingdom is diametrically opposed to Satan’s kingdom! And Jesus is so much stronger than Satan. Satan may be a “strong man,” but Jesus can tie up the strong man and take anything from his house that He wants. So you and I need to choose to follow Him and take His side. Because whoever is not with Jesus is against Him, and whoever does not gather with Jesus scatters. We didn’t get to finish this section last time. There are only 5 verses left where Jesus finishes His response to the Pharisees, verses 33 through 37. I decided to leave this last paragraph to this week because we were running out time, and because these 5 verses are really powerful and really practical for our lives today. They should be familiar to you. They are really familiar to me as I studied them and studied them and then wrote about them in my doctoral project and then my book and then have preached about them from out of my book for the last 8 years. The Greek word is perisseumatos. Jesus starts by talking about trees. He just got done talking about the unforgivable sin of the blasphemy against the Holy Spirit. Attributing to Satan what is clearly the work of God and rejecting Jesus forever. And then the very next verse, Jesus is talking about trees. Is Jesus talking about horticulture? No. He’s talking about people. Why would the Pharisees say what they said about Jesus in verse 24? How could they say that? If a tree is good, and by that He probably means healthy, then its fruit will be good. If the root system and the trunk and the heart of the tree is healthy, then it will produce healthy fruit. Or if you make a tree bad (or unhealthy), guess how the fruit is going to be? Rotten. And you can always recognize what kind of tree (healthy or unhealthy or even what species of tree: apple, orange, fig, whatever) it is by its fruit. So Jesus says, it’s no wonder that these men said what they said in verse 24. What comes out of the bottle was what was in the bottle. #1. GET REAL ABOUT YOUR HEART. The reason why Jesus uses such strong language is to wake these Pharisees up to reality. They are a brood of vipers. They are saying these bad things about Jesus because their hearts are bad. And they need to wake up to their condition and tend to their sinful hearts. In other words, they need to repent. And if they are too far gone to repent, then the people around them and the people listening (like us!) need to take note and not go down that road themselves. Your words reveal your heart. I’m sure that these men thought they had good hearts. Jesus is calling them to get real about their hearts. The heart is the real you. The you on the inside. The heart is control center of the human being. It’s the part of you that worships, that wants, that desires, that prioritizes, that is loyal to something or someone. We tend to use the word “heart” just for the emotions. But it’s a lot more than the emotions. It’s bigger than just your feelings. Your heart is the worship core of you that directs your being. The Proverbs say that the heart is the wellspring of your life. The Lord Jesus has already taught us how important our hearts are in the Sermon on the Mount. Remember, His kingdom is not just upside down. It’s what? Inside-out. And that includes our words. Our words come from our hearts. Jesus was calling these men to change at their very root. It wouldn’t be enough to just stop saying these things about Jesus and Beelzebub, they would need to change at the very root of their beings. They would need a new heart! The good news is that Jesus is in the business of giving out new hearts to those who repent and trust in Him. If not, I invite you to do that right now. Turn from your sin and turn to the Savior. Because we don’t just naturally have good hearts. No, naturally, our hearts and deceptive and wicked. But Jesus died on the Cross to forgive us our sins and to give us a new heart. That’s what these Pharisees believed about themselves. Get real about your heart. But we who are already followers of Jesus know that even though we have been given a new and good heart that we still need to tend to our hearts. We still need repentance and growth in faith. We need to stay real about our hearts. And if you’re finding that there is still evil things come dredging up out of you (and I’m sure you do), then there are still things in your heart that need repenting of and turning from. We can’t just fix things on the word-level. We have to have them fixed on the heart-level. And that requires getting real about our hearts. What is your heart desiring above other things? Because what controls your heart will control your life and come out in your words. I’ve been fighting with anxiousness the last month or so. And it’s come out in my words. It’s come out in anxious words. Those words would not have been my words if my heart had been in the right place. And I apologize to those of you who have been affected by my words. Because you’re getting a taste of what’s in my heart. If you got real about your heart, what would you need to change? Of what would you need to repent? What promise of Christ’s do you need your heart to claim? Because this is serious stuff. Verse 36. Jesus is NOT saying that you can save yourself on the day of judgment by having good words. Jesus is saying that on the day of judgment (which is coming! ), the words you have said will be evidence of what was in your heart. If you have trusted in Jesus, there will be plenty of words that show it. And if you have not trusted in Jesus, there will plenty of words that show that, too. Because they will reveal the reality of your heart. Did that happen for the thief on the Cross? Sometimes we think that the thief on the Cross didn’t have time to change. But his words changed, didn’t they? He went from hurling insults at our Lord to defending Him and asking Jesus to remember him when He came into His kingdom. His heart changed, and so did his words. Notice how deep this accountability goes. Jesus doesn’t just bang on those who speak maliciously about His identity. He goes after every “idle” word. V.36 again. Not just the big ones. But all of the little ones. Any of our words that don’t come out of a good heart. #2. GET CAREFUL ABOUT YOUR MOUTH. You can’t do that without getting real about you heart! But it comes out in what you say. So, that’s talking about gossip. And also about sinful exaggeration. And meddling in other people’s business. And “obscenity, foolish talk or coarse joking” (Eph 5:4). Our Lord says that we will have to give account for every careless word. Not just every malicious word that we intentionally threw out there. But every one that we weren’t even really thinking about, but out it popped from our sinful hearts. We will have to give an account. Think about every conversation you had at Thanksgiving this year. Are you happy with everything you said about anything you said at Thanksgiving this year? When you sit down with your Lord someday for this accountability review, is there anything that you said that you will be embarrassed that will be brought up? Now multiply that by every single conversation you’ve ever had. And that’s what you will need to be accountable for on judgment day. If you belong to Jesus, then all of your sinful talk will be forgiven. And it has been. But you will, apparently, still need to go over it with Him. And that counts for every word you have tweeted and posted and texted, as well. Once a week, I go back over all the emails that I have sent in the previous week and remind myself of what I’ve been saying and working on. And I also go back over my social media accounts once a week to see what I have liked and shared and posted and said. Someday, I’ll have to do that with my Lord. Every DM on Twitter and every PM on Messenger. Everything said under my breath in the checkout line or in the intersection. Everything I only said to my bestfriend and my wife. There will be an accountability review. So now’s the time to get careful about your mouth. Again, you can’t do that by just focusing your mouth. You’ve got to go to the heart level. If you are ripping people up one side and down the other, you can’t just stop that by sheer force of will. You’ve got to repent and trust in the promises of God for there to be real and lasting change. But you can’t let your mouth just run on where it wants to go. Because someday soon you’re going to have to talk to the Lord about all of your choices, and not just the big ones. It turns out the small ones are big ones, too. I recommend starting with prayer that the Lord would reveal to you the sinful words that you most recently have uttered, that came spilling out of the overflow of your heart. And then take those words to the Lord and ask Him for forgiveness. And if they were uttered to someone else in a way that hurt them, then go to that person and ask for their forgiveness, too. Better to talk it out now than for it to be a big surprise on judgment day. If you remember, last week, Jesus healed a man on the Sabbath, and He got into trouble with the Pharisees. He was always getting into trouble with the Pharisees. This time they were unhappy that Jesus had healed a man on the Sabbath. They claimed that He was breaking the Law. But Jesus claimed that He WAS the Law. He claimed to be The King of Rest. Greater than Great King David. Greater than the Levitical Priesthood. Greater than the Temple that stood for the People of God. Greater even than the Law of God itself. Jesus is the King of Rest. Well, that’s NOT how the Pharisees wanted that interaction to go! They were so rip roaring mad that they began to plot out how they could kill Jesus. And in today’s passage, they came up with idea. It’s a really bad idea. But if it had worked, it would mean the end of Jesus. They decided to claim that Jesus was not the King of Rest, but the King of Demons. 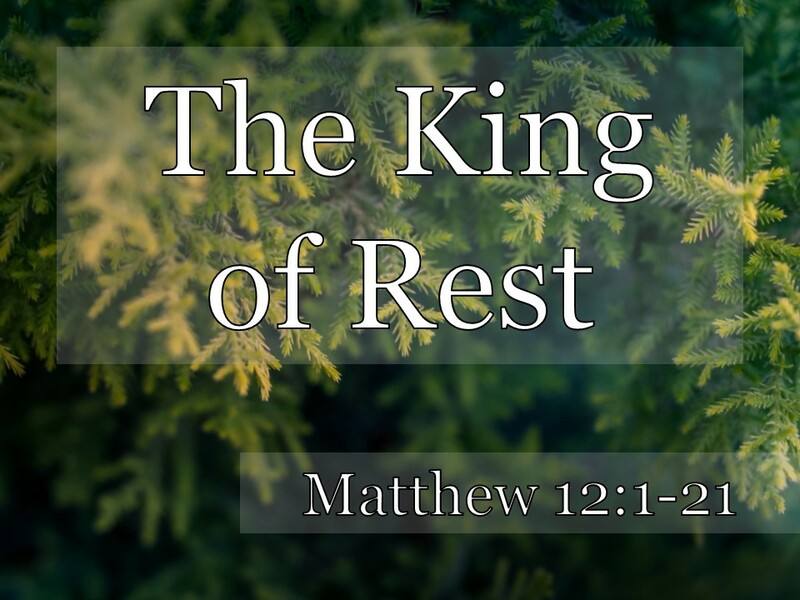 Jesus was claiming to be The King of Rest. But the Pharisees are claiming that He is instead the King of Demons, or at least working for and with the King of Demons. Now, I’m sure that you did not come to church today wondering if Jesus was in league with Satan. You just came to give thanksgiving this morning. But aren’t just SO THANKFUL that this is true? That’s what I want to call this message today. Because there are at least three big things in today’s passage that we should be rejoicing about every single day that we live. So very thankful! The people sure thought so. Think about what this man’s life was like. He could not see. And he could not talk. So he was cut off in significant ways from the people around him. But even worse, inside of him was an evil spirit. He couldn’t see, but he was tormented by this demon. And he couldn’t tell anybody what that was like! We don’t know what he was like. What forms that possession and oppression took beyond his blindness and muteness. He was shut in himself with a demon. I’ll bet he was thankful! Notice that they don’t dispute the miracle. They can’t argue with that. So they argue with the only thing that they can think to argue with. They claim that Jesus is in league with Satan. Now, that is crazy to say. But if they could convince everybody that Jesus is an evil sorcerer in league with Satan, then it would be a capital offense, and Jesus would be put to death. Jesus said back in chapter 10 that they were going to call Him that. Remember? And He said that we should expect to get some of that, too. Jesus said, “It is enough for the student to be like his teacher, and the servant like his master. If the head of the house has been called Beelzebub, how much more the members of his household!” (10:25). They called Jesus Beelzebub or in partnership with Beelzebub. And we so thankful that it is not true. I’m serious. Here’s point number one of three. #1. JESUS IS NOT IN LEAGUE WITH SATAN! I know that sound silly to say. Just for a second think about what if He was. Okay, that’s enough. We don’t need to go there for very long to be incredibly grateful for the truth. In verse 25, Jesus fights back with the truth. Jesus says that Satan isn’t stupid. That’s His first answer to this stupid assertion. Satan is not so stupid that he would send Jesus to drive himself out of people. Jesus says if you have a kingdom, a city, or a household, you don’t intentionally set one part of it against another unless you want civil war. President Abraham Lincoln famously alluded to this very passage to warn our country over what was going to happen in the late nineteenth century. Jesus said that Satan wasn’t so stupid as to empower Jesus to bring the kingdom of God because it would mean the end of his fallen kingdom. He isn’t going to work against himself like that! Jesus and Satan are not in league with each other. Even to do the work of the kingdom of God! The demons are cast out. Jesus is whomping on the evil kingdom of Satan. They had a lot of incantations and phrases they used. And their excorcisms weren’t nearly as effective as Jesus’. Jesus just had to say, “Go,” and they had to go. But if Jesus was doing this by the power of Satan, then that throws some shade on their ministry. No, that’s not what’s going on. Jesus is not in league with Satan. And that means that the kingdom of God has arrived. That the kingdom of God is here. Now, of course, the kingdom hasn’t come yet in all of its fullness. This is not as good as it gets. It’s going to get amazingly better. So the Kingdom has arrived, and we have everything to be thankful for. #2. JESUS IS MUCH STRONGER THAN SATAN! Not only are they not on the same team. They are on opposing teams. But they are NOT EQUAL teams! Jesus is so much stronger than Satan. It’s not really a contest! Now, follow Jesus closely here. It’s a little surprising. Who is the robber in verse 29? Who is performing a home invasion? Who is the strong man of verse 29? Satan is a lot stronger than any of us here on our own. If we went up against Satan all by ourselves, we’d be like the man in verse 22. Possessed, oppressed, shut down, and beaten. But what if Jesus wants what the strong man has stolen and stockpiled in his house? Can Jesus beat up Satan? He can walk in, tie him up, and walk out with whatever He wants. Remember the contest between Jesus and Satan in the wilderness? The temptation in back in chapter 4. There is someone who is strong than the strong man. “...the one who is in you is greater than the one who is in the world” (1 John 4:4). He’s a defeated enemy on his way out. He is a roaring lion. He is someone that is a enemy to be wary of. But he is not winning and will not win. I think sometimes we give Satan way too much credit and fear him way too much. Respect his power and don’t trust him, for sure. Don’t think that you, on your own, are any match for Satan. But don’t give him too much credit. And don’t cede to him any ground. Because Jesus is so much stronger than Satan. We can be so thankful. Jesus kingdom will come and it will not fail. That means that we need to choose which side we’ll be on. You don’t automatically end up on Jesus’ team. You are not with Jesus by default. In fact, by default you are with the other one. So this is a call to not pretend or think that you are neutral. It’s a call to join Jesus’ kingdom. Is a way of inviting us to be WITH HIM. To take Him up on His offer to come to Him and find rest for our souls. Wade Nolan was our wild game dinner speaker two times in the last ten years. He died this year and went to be with the Lord. I remember the first time he spoke, he told us about this fence. That guys like to think that they are on the fence. They haven’t yet decided or made up their minds about Jesus. This is not a call to get off of the fence. It’s a call to make sure you are on the right side because there is no fence. And the right side is Jesus’ side because He gonna win. So thankful that Jesus is so much stronger than Satan. Do you need to hear that this Thanksgiving week? Does it seem to you like the opposite is true? Or even that Satan is winning? No. That’s not true. That’s not how it is. Satan is alive and a dangerous enemy. But He is a defeated enemy on a short leash, and he will not win. Now, I know that that’s a scary passage. We focus on the “but one” part. Just knowing that there is an unforgivable sin is a scary thing to understand. And Jesus was warning these people that they were doing it or getting really close to it. Blasphemy is an extreme slander. It’s an outright and total lie about Who God is. And the blasphemy of the Holy Spirit is attributing to Satan what is clearly the work of God. It’s not just speaking against Jesus. V.32 makes that clear. It’s speaking against Jesus in such an irretrievable way, such an irrevocable way, such an unrepentant hard hearted way that you don’t care what the Holy Spirit says about Jesus, He is the devil. You utterly and totally reject the witness of the Spirit to the Person of the Son. Now, I know that you might be afraid that you have done this unforgivable thing. If you are afraid that you, I can tell you that you have not yet done it. Because those who have done this, don’t walk back from it. The Apostle Peter denied that he knew Jesus. Judas betrayed Jesus and though he felt bad about it, he never repented and came back. The unforgivable sin is rejecting Jesus and still rejecting Jesus and always rejecting Jesus. Rejecting Who the Holy Spirit has clearly revealed that Jesus is. Unless that’s what you are doing right now, you have committed this sin. So think about this from verse 31. The Lord forgives every kind of sin but one! That’s what to be thankful for today. Your sins can be forgiven! Does verse 31 include your sins? Think about your sins for just minute. Not more than a minute. But just look back over your past. I’m so ashamed of my sin. Including the ones I still struggle with today. Now, put those sins into verse 31. I know that Jesus said these things to warn the Pharisees. You know, they were really the ones in league with Satan. They didn’t know it, but they were playing his game. Jesus warned them to repent while they still could and join His winning team. And He’s inviting you and me to do that, too, today. Jesus said, “Come to me, all you who are weary and burdened, and I will give you rest. Take my yoke [of discipleship] upon you and learn from me, for I am gentle and humble in heart, and you will find rest for your souls” (Matthew 11:28-29). And He’s paved the way. He died on the Cross to pay for your sins so they will be forgiven. Have you trusted Him for that? And there is no sin that is too big for Him to forgive. Certainly if you reject Him, He will reject you. But if you want to come to Him, He will in no way leave you out. He is so strong! He is stronger than the strong man. He is bringing His kingdom which will rule over all. And He invites you to come to Him. If you don’t you are against Him. There is no fence. “He who does not gather with [Jesus] scatters." 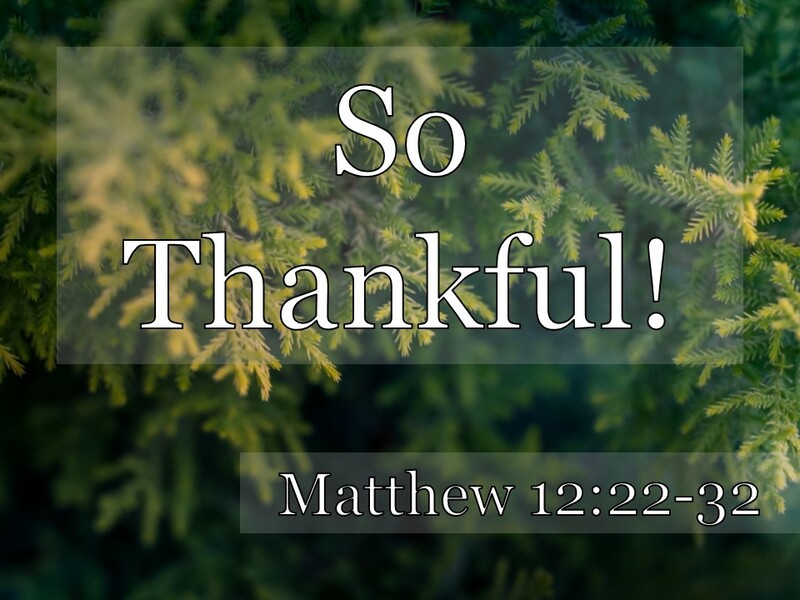 But all who come to Jesus have every reason to be SO VERY THANKFUL. Rather than casting all your anxieties on the Internet, which cares for no man, cast them on God, for he cares for you (1 Peter 5:7)...Rather than meddling, focus on your own concerns. We need to let God be the one who manages all knowledge. Only he is capable, and only he can be trusted to do so with perfect wisdom...Our comfort lies not in holding all knowledge, but in trust the One who does” (pgs. 115-116). I highly recommend this book. I’m definitely going to read the follow-up, In His Image: 10 Ways God Calls Us To Reflect His Character. This is one of those places where the chapter divisions are a little unhelpful. Matthew didn’t put the chapter and verse numbers in here when he wrote his gospel. Those were added later to help people find their way around. I think chapter 11 flows right into chapter 12 without skipping a beat or really changing the subject at all. Have you taken Jesus up on His invitation? Have you come to Him? Have you taken His yoke upon yourself and become His disciple? Even this last week, have you found His yoke to be easy and His burden to be light? To find your rest in Him? Which means a whole lot of things, a lot to talk about today. But the Sabbath as given to Israel was, at heart, a day of rest. A day for ceasing of work. A day for cessation of labor. A day of desisting, abstaining from work. A day of rest. And Jesus claims to be the Lord of that Day. The Boss of the Day of Rest. The Boss of Rest. The Lord of Rest. What an interesting juxtaposition of ideas, isn’t it?! When we think of powerful kings, we don’t always think about resting, do we? No, we tend to think about working. Serving. If you serve a powerful king, you work for him most of the time, right? He’s the King of Rest. Most of the time when we think about “Sabbath” we think about a list of do’s and don’ts, right? What you are allowed to do and what you are not allowed to do on the Sabbath. That is part of the problem here in Matthew chapter 12. The Pharisees accuse Jesus and His disciples of breaking the Sabbath. And breaking the Sabbath rules. This story is about the identity of Jesus. We’ve said all along that the Gospel of Matthew is a theological biography of the most compelling Person Who ever lived. 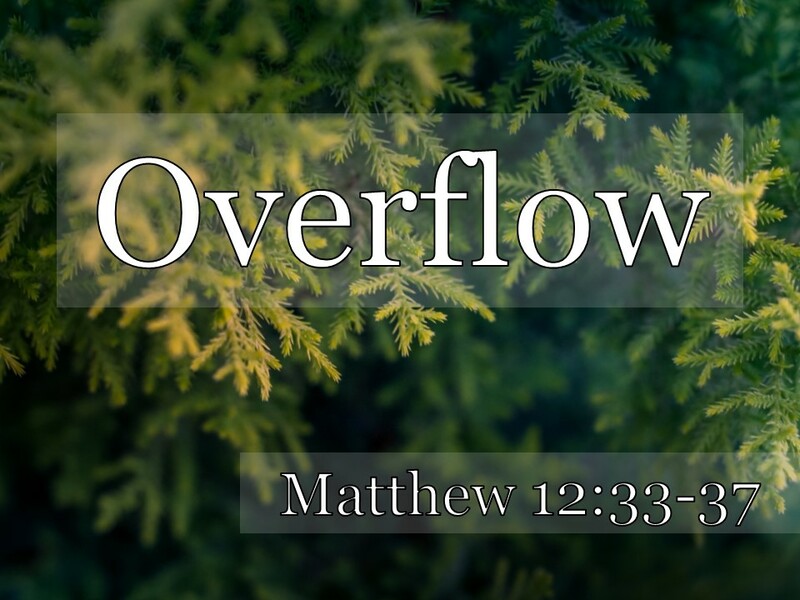 Matthew is intent on revealing to us Who Jesus really is. What Jesus was all about. Who is this Person Jesus? We’ve said all along that the big question in Matthew really is, “Who Does Jesus Think He Is?” Who does this guy think He is? We said the last two weeks that the conflict is starting to heat up for Jesus. From here until the crucifixion, Jesus gets into more and more trouble. He makes many people, especially the Jewish leaders, more and more uncomfortable. It’s not that they don’t understand what He’s saying as much as they do, and they don’t like what they are hearing. So they begin looking for ways to get Jesus into hot water. And here’s one. They accuse Him and His disciples of breaking the Law on the Sabbath. Chapter 12, verse 1. Now, for us, this doesn’t like any big deal. We might think that their eating the wheat from somebody else’s field was stealing. But that’s not what these guys are concerned about. The Old Testament Law (Deuteronomy 23:25) made provisions for the poor and for travelers to eat from the corners of the fields as they made their way past. So what are the Pharisees so upset about? They’re upset that the disciples are working! Now, this doesn’t look like work to me. But they had all of these rules. The Pharisees had made all of these rules to make sure that nobody did any work on the Sabbath day. The rule was “no work.” God gave them that rule. But they made a whole bunch of rules to make sure that that rule got followed. In fact, it had become a lot of work to make sure that nobody worked! Their rules said no picking, no threshing, no winnowing on the Sabbath. So if you had a little grainfield fast food, and you picked some heads, rubbed them open and tossed off the chaff, YOU WERE WORKING!!!! Now, how would you answer that if you were Jesus? But that’s not where Jesus goes here. Because He knows that it’s not really about the Sabbath. Jesus knows that it’s really about Who He is. Now, I would have NEVER come up with that! And then He reminds them of this story from 1 Samuel 21. Do you remember that from a few years back when we studied 1 Samuel? David and his companions were desperately hungry, and they ate the consecrated bread which they technically shouldn’t have done. And what did the Lord say about that? Did David get in trouble with God? Scripture does not condemn David for that. But how is that answer to the Pharisees here? It is if Jesus is arguing from the lesser to the greater. It feels like it’s arguing from the greater (the consecrated bread) to the lesser (the handpicked cereal). But it’s actually arguing from the lesser (David and his companions) to the greater (Jesus and His companions)! If David and his friends could eat that which was technically wrong, and it be okay how much more can Jesus and His friends eat something that you could easily argue isn’t even technically wrong! Just wrong in these guy’s eyes. In other words, Jesus is greater than David. Who really works on the Sabbath? Well, those priests do. It’s their job. If they don’t work on the Sabbath, the whole thing doesn’t work. The temple doesn’t work. So they must be able to work on the Sabbath without breaking the Sabbath. We don’t think anything of it. But imagine the most important object, place, thing in your life and imagine someone coming along and saying that He was greater than that. The temple stood for so much to those people! If it was knocked down, it would mean the end of the world for them. It stood for Judaism itself. “If you had known what these words mean, 'I desire mercy, not sacrifice,' you would not have condemned the innocent.” These disciples. You don’t understand the Bible. Hosea 6:6. And you don’t understand mercy or compassion. People are more important than stupid rules. The whole point of the Law is love. Jesus says that He knows this because He is not only greater than King David. And not only greater than the priests. And not only greater than even the temple. Because the Sabbath is my day. “I am the Lord of the Sabbath. I am King of the Sabbath. The Sabbath exists for Me. Wow. Do you see how bold that is? Can you imagine someone saying that about some other Law? He’s basically claiming to be God, isn’t He? Who else can claim to be the Lord of the Fourth Commandment? I have only three points this morning, and this is number one. #1. BELIEVE IN THE KING OF REST. The whole point is His identity, isn’t it? Is Jesus Who He believes He is? Do you believe that Jesus is Great David’s Greater Son? Do you believe that Jesus is greater than the Levitical Priesthood? Do you believe that Jesus is greater than the Temple? Do you believe that Jesus is the Lord of Rest? I do. And I invite you to believe it, too. The fact is that many people do not. You see what is going on? They want to trap Him. And they are using the Sabbath to do it. They are tempting Him, aren’t they? They can see that He wants to heal this guy. And they want Jesus to say that healing somebody on the Sabbath is okay. When they did not agree. That’s the WORK of a doctor, right? Should you do the work of healing somebody on the day when we shouldn’t work? With a shriveled hand in that society there weren’t very many jobs that this guy could do. He can’t work. But can you do the work of healing him on the day when nobody should work? He’s arguing from the lesser to the greater again, isn’t He? This time the lesser thing is a sheep. And we are the greater thing. How much more valuable is a man than a sheep. Good to hear it! Congratulations, you’re worth more than a sheep! Of course it’s lawful to do good on the Sabbath! To show mercy on the Sabbath. To show compassion on the Sabbath. What a reaction. What hard hearts! You see how this isn’t about what you can and can’t do on a particular day of the week? It’s all about Who is Jesus, isn’t it? 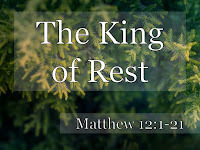 And do you believe that Jesus is the King of Rest? Think about this. Jesus didn’t even do any work, did He? He just spoke and the guy was healed, and these people wanted to get rid of Him! By the way, Jesus knows that He is jumping into their trap, and it doesn’t bother Him. It’s all part of His Father’s plan. They may think that they have caught Jesus. But really Jesus has caught them. He’s given this man rest. Hasn’t He? He’s given him the ability to work again. But He’s also given him a taste of the kingdom. The kingdom of rest. He’s taken away a little bit of that man’s worry and weariness and burden. That’s a picture of the kingdom that’s coming! #2. FOLLOW THE KING OF REST. Don’t just believe that He is the King, but join His kingdom and live out the values of that kingdom. For example, value people over stupid rules every time. That’s what our King is like and what our Kingdom is like. I’m not saying to throw out the Law. But make sure you are fulfilling the purpose of that Law. If we aren’t loving people then we aren’t doing the Law even if we say we are. So if we are citizens of the Kingdom of Rest, it’s lawful for us to do good to others. Or do we find every excuse to work around it? Last week, I got a call from someone who needed some gas money and some food. And it was really inconvenient. The call was at the very end of the evening for me. And I did not want to go out and help somebody. So I got up and went out to meet them and help them in the name of our King. I was trying to follow the King of Rest. It actually meant that I lost a little of what I considered to be rest. But what did Jesus give up to bring me rest? He gave His whole life! When Jesus holds out His hand and says, “Come to me all you who are weary and burdened and I will give you rest,” did you ever think what that rest cost Jesus to give us? He’s aware that they want to kill Him. He knows. So He withdraws. But He doesn’t stop. Many follow the King of Rest, and He gives them rest. He heals all of their sick. And He doesn’t blow a trumpet about it. He’s not televangelist. He’s not like any other pretend Messiah out there. It’s not time for Him to go public, so He tells them to keep it quiet. But He keeps healing. This person. That person. That person. This person. #3. REST IN THE KING OF REST. Matthew loves His Old Testament, doesn’t he? This is the longest quote from the Old Testament in the Gospel of Matthew. Matthew says that Jesus healed like this, powerfully yet quietly, to fulfill Isaiah 42, verses 1 through 4. Matthew recognizes that Jesus is the Suffering Servant of the Messianic Prophecies of Isaiah. And He quotes Isaiah at length to show us. And it sure sounds like Jesus, doesn’t it? What a unique and compelling person! It sound like Jesus’ baptism to me. I love that description. This like last week when He said that He is gentle and humble of heart. What good is a bruised reed? A little bent over twig? He’s so gentle. So tender. So careful. With losers! With failures. With the marginalized. With the hurting. With the weary and the burdened. Just a tiny little smoke coming from that wick. It would be so easy to dismiss it. But Jesus cups it and blows on it gently and shields it from the wind. Are you that little smoldering wick? Do you see how you can trust Him? Do you see how you can rest in Him? Do you see how you can put yourself in His hands? And He’s not going to change. They will rest in the King of Rest! 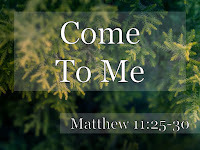 [Matt's Messages] "Come To Me"
He basically said, “Yes, I am the one.” but He did it by pointing to the deeds of the Messiah, how He Himself was fulfilling the job description, the Messianic profile, provided by the Old Testament. And then He spent most of the rest of the chapter explaining how important it was to answer that question correctly. Is Jesus the one who was to come? If you answer yes, you will be blessed. He said, “Blessed is the man who does not fall away on account of me.” On account of Jesus doing things differently than you might have expected. But if you ultimately answer no, you will experience woe. Not joy but sorrow, judgment, and woe. Jesus denounced those who had rejected Him and predicted their judgment. And it’s right after that that Jesus says what He says in today’s passage. This flows right out of that. We may study it on its own, but it doesn’t stand alone. In today’s passage, Jesus basically stops to pray, but prays out-loud for all to hear. And it’s definitely worth overhearing! And then, Jesus makes an amazing assertion about His relationship with God. And then He offers a glorious and wonderful invitation. But first we need to eavesdrop on Jesus’ prayer. Matthew has so helpfully recorded it for us so that we can listen in ourselves and hear what Jesus said to His Father. Verse 25. That’s Lord of absolutely everything, isn’t it? I mean you and I have learned to call Him “Father, too,” but we get that from Jesus. We’re going to see that in verse 27. He would not be our Father if it were not for Jesus. But He has always been Jesus’ Father and always will be. Jesus lifts up His voice to praise God, the Lord of heaven and earth. What for? It might surprise you at first. Jesus praises God for hiding things. Did you catch that? Look at verse 25. What are the "these things?" It doesn’t say directly, so you have to look at the context to determine it. I think it’s simply the mysteries of the kingdom. The blessings of belonging to the Messiah. The judgments of rejecting Him. All of the inside scoop of being a follower of the Messiah. That’s hidden from some and revealed to others. I think that means the so called wise and learned. The people who think they are wise and learned and sophisticated and smart. Who’s that in the context of Matthew gospel? Well, the scribes and the Pharisees for one. They thought they were too smart to submit to Jesus, didn’t they? And these cities that Jesus was just pronouncing judgment upon. Korazin. Bethsaida. Capernaum. They thought they were too wise and learned to be taken in by claims of Jesus of Nazareth! They were too proud! They were too arrogant. They thought too highly of themselves. So they were left out in the cold. And Jesus praises God for that. Can you praise God for that? Let’s not be more spiritual than Jesus. Jesus saw this “hiddenness” as God’s wisdom at work. But wasn’t just hidden, was it? It was also revealed. To whom? To reveal these things to little children. I don’t think that means just literal little children. I think that means the humble. Those who are like little children. Trusting. Humble. Modest. Those who did not think of themselves as the “wise and learned” of the world. Those who didn’t think too highly of themselves, but thought rightly of themselves. Those who are like little children. Because that’s the kind of person to whom the Father reveals the secrets of the kingdom. God the Father delights, takes great pleasure, in revealing the secrets of the kingdom to those who receive them like infants. Those who humble themselves and are trusting. They have faith. Remember when Jesus pulled a little guy, a little child, into the middle of the circle and said, “Unless you become like this little guy, you won’t see the kingdom.”? The proud and sophisticated and “wise and learned” of this world do not get it. And that’s a judgment on them. The Father is withholding it from them. So to get the kingdom, you have to become like a child. If you have, don’t just want to join Jesus in praising God? Do you remember the first beatitude? The first statement of blessing and flourishing? The gateway to the others? That’s what Jesus is thanking the Father here for. I don’t know about you, but I don’t want to be opposed by God. I don’t want God as my opponent. See how Jesus thanks the Father for being the opponent of the proud? It’s right for Him to do that. It’s good. But I don’t want that to be me. And I don’t want it to be you, either. And praise Him and thank Him for being included. 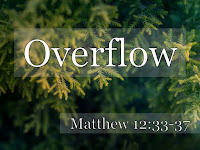 Now to me, that sounds like it almost belongs in the Gospel of John, not the Gospel of Matthew! That’s the kind of teaching that John picked up so much of and Matthew tends more hint at. But here it is in Matthew in all of its glory. Let’s walk through it slowly. Jesus says, “My Father.” He has a special relationship with God. Remember what happened at His baptism? Remember the voice from heaven? “This is my Son, whom I love; with him I am well pleased” (Mt. 3:17). And Jesus knows that the Father has handed over to Him all things. This verse is supposed to blow your mind. We aren’t supposed to be able to wrap our minds around this. But as we try, our minds expand and grow! Listen to what Jesus says about His relationship with God. So there is a special relationship between those two. (I think it’s through the Spirit. He isn’t mentioned, but I’m sure He’s excluded either). There is a special relationship between the Son and Father. Nobody knows Jesus inside and out like the Father does. Unparalleled intimacy. Exclusivity. Direct and immediate knowledge. No one knows the Son except the Father, and no one knows the Father except the Son. You want to know God the Father? You have to go through God the Son. No one has ever seen God the Father, “But God the One and Only, who is at the Father's side, has made him known.” That’s in John. So many of you in this room do. Praise God that the Son has chosen to reveal the Father to you! Now, this is only one side of the coin of choice in our salvation. Some people like to emphasize one side of the coin and forget about the other. Some people like to emphasize God’s sovereignty like verse 27 does. Who chooses whether or not we are saved? But other people like to emphasize the other side of the coin. Is that in this passage, too? Of course it is. The pride of the “wise and learned” in verse 25, the responsibility of Korazin, Bethsaid, and Capernaum for what they freely chose when they rejected Jesus. They made unforced choices, too. Some people like to emphasize that and miss God’s sovereignty. Both are true. Both are important. It may seem like a paradox, but it’s a paradox the Bible doesn’t have any trouble with holding both sides of. God’s sovereignty and human responsibility. In pop culture, they use the phrase, “Come to Jesus” to describe a hard conversation where someone is being forced to make a decision. Yes, there is an all important decision that must be made, but this is all invitation and not intimidation. Have you been thinking about this invitation as you have worked on your memorization? “Come to me,” Jesus says. This is all about Him. Listen to all of the personal pronouns. He thinks He’s the Son of God and God the Son! That’s Who He thinks He is! And He’s holding out His hand for us to come to Him personally. Well, I think they were weary and burdened by the scribes and the Pharisees. They were worn out trying to please other people and follow the Law in such a way as to earn their salvation. That will wear you out! You trying to do that? Laboring under the Law and weighted down by law-keeping? But they were also weary and burdened by the Romans, weren’t they? They were oppressed. They were pushed down. They had the crushing weight of the world on them. Life is hard just as it is. Not to some idea, but to Jesus Himself. It’s word of blessing. A word of peace. Where the striving ceases. Where you don’t have to impress anybody. Where you get a taste of what the kingdom will be like. I think we get a taste of that rest now and we will get the rest of the rest in full when we get the rest of the kingdom. And we will get it all from Jesus. Look in verse 29 to see what it means to come to Jesus. So there is a yoke. But it’s not the like yoke of the Law. You know what a yoke is, right? It’s that big wooden thing that ties a couple of oxen together to pull the plow or whatever. A yoke a subjection. It does provide limitations. It does put you in harness. But look whose yoke it is! I think that means that Jesus is the guy in the other side of the yoke! He’s inviting these people and us to be His disciples. That’s what it means to get yoked up with Jesus. To learn how to walk this field with Him. He’s right there. You are in tandem with Him. I think it’s amazing that Jesus says that He is humble when He just said that God the Father has entrusted everything to Him! Look what He’s doing with all of that power! Look what He did in coming here. Look what He did on the Cross! He’s not saying that there is no yoke or that there is no burden. He’s not throwing out the Sermon on the Mount or the Great Commission. There is a yoke, but it’s easy. There is a burden in following Jesus. Take up your cross and follow Him! But you’ll find that that burden oh so light. I think the picture is that if you are yoked to Jesus, then Who do you think does all of the heavy lifting? Do you hear the invitation? He’s inviting you to come to Him.